Three CD Collection. Disc 1 – 16 tracks; 79 minutes: Disc 2 – 15 tracks; 79 minutes: Disc 3 16 tracks; 80 minutes. 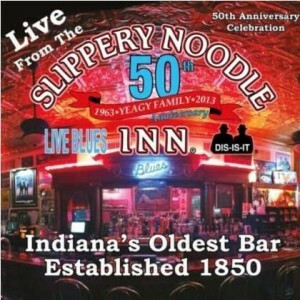 The Slippery Noodle in Indianapolis occupies a building that has a colourful history dating back to the Civil War, as the most informative booklet in this triple CD package tells us. The recent history of the building saw the establishment of a bar which did a little music to the present day 7/7 music venue and this compilation celebrates the 50th anniversary of the present family of owners. There have been three previous live compilations of music from the Noodle, released in 1993, 1994 and 1997. All the music on these three CDs was recorded live at the bar between July 2012 and September 2013 and the sound quality is mostly very good. The music is a mixture of local bands and visiting national acts and most get two numbers each. Whatever your taste in blues and roots music you should find something to please here as we get straight blues, shuffles, soul, blues rock and outright rock too. Probably the only genre notably absent is acoustic blues which may not suit the taste of the Noodle locals! With so many acts and such a generous helping of material the reviewer has his work cut out to summarise the music on offer. Highlights are many but several left me with a desire to hear more of their work (which is rather the purpose of samplers). Fans of the Allmans should check out Boscoe France who does a great version of Dickey Betts’ “Blue Sky”. The Jon Strahl Band give us some excellent slide-driven blues on “Time Vending Blues” and the traditional “Corinna”. There is a lot of guitars and few horns on these recordings but Greg Foresman has a sax player (Andy Kopis) on a long and interesting version of “32-20 Blues” and a storming medley of JJ Cale’s “Call Me The Breeze” with a slide-driven boogie called “Flesh And Blood”. Female soul singers include Andra Faye And The Rays doing Etta’s “Something’s Got A Hold Of Me” and “Down To The River”. If blues-rock is your preference try the WT Feaster Band or Ellusion who produce one of the best versions of “With A Little Help From My Friends” you are likely to hear; not blues but really well done. In contrast their other offering is a medley of “Folsom Prison Blues” and “Shout” which blends country and soul/R n’ B in a most interesting way. Among the better known national acts represented here soulman Johnny Rawls gives us great readings of “Red Cadillac” and “Cheatin’ On Me” which show what a good guitarist he is as well as a superb soul singer. Texas bluesman Andrew ‘Jr Boy’ Jones has an extended workout on “I Know What It’s Like” while Big James And The Chicago Playboys only get one track but appropriately it’s “I Luv Em” (the blues that is!) with plenty of driving horn work from Big James on trombone and trumpeter Charles Pryor. Soul/bluesman Tad Robinson lives locally but is one of the top vocalists on the current scene and demonstrates that superbly on “Back For More” and “Rich Man”. Biscuit Miller And The Mix give us a great shuffle “Walk With You Baby” on which the two guitarists Alex “Southside” Smith and Mahiko Fujita show a lightness of touch and Biscuit supplies excellent vocals. It is only possible to select a few of the acts here for comment. Suffice to say that all blues fans will find something of interest here. 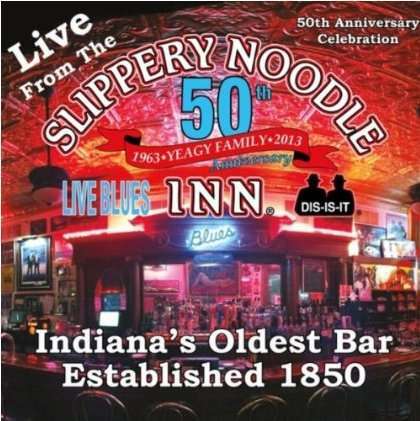 Here’s to the continued success of The Slippery Noodle – long may it gives us the blues!